Earl Kenneth Hines, universally known as Earl "Fatha" Hines, (28 December 1903 ? 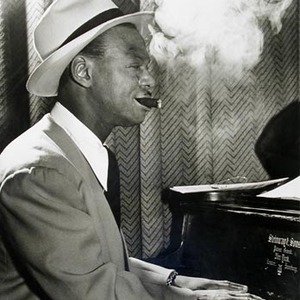 22 April 1983) was a jazz musician, often referred to as "the first modern jazz pianist". In 1928 (on his 25th birthday) Hines began leading his own big band. For over 10 years his was "The Band" in Al Capone's Grand Terrace Cafe ? Hines was Capone's "Mr Piano Man". Hines recorded for Victor in 1929, then after a gap for Brunswick from 1932-1934, Decca from 1934-1935, then after another gap, Vocalion from 1937-1938 and Bluebird from 1939-1942 (nearly all among the best Black Jazz of the era). At the start of 1949 Hines rejoined Armstrong in the latter's "All Stars" "small band", where Hines stayed through 1951. He then led his own small combo around the States and Europe. At the start of the jazz-lean 1960s he settled in Oakland, California, opened a tobacconist's, and came close to giving up the profession. Then, in 1964 Hines was "suddenly rediscovered" following a series of concerts in New York. He was the 1965 "Critics' Choice" for Down Beat Magazine's "Hall of Fame". From then till he died he recorded endlessly both solo and with jazz notables like Cat Anderson, Buck Clayton, Roy Eldridge, Ella Fitzgerald, Paul Gonsalves, Sonny Greer, Lionel Hampton, Coleman Hawkins, Johnny Hodges, Budd Johnson, Jimmy Rushing, Stuff Smith, Sarah Vaughan, Joe Venuti and Ben Webster. Possibly more surprising were Elvin Jones, Peggy Lee, Charles Mingus, Dinah Washington ? and Ry Cooder. But his most acclaimed recordings of this period were his dazzling and endlessly inventive solo performances, which could show him at his very best, "a whole orchestra by himself". Solo tributes to Louis Armstrong, Hoagy Carmichael, Duke Ellington, Cole Porter, and George Gershwin were all put on record in the 1970s. Hines also toured Europe again regularly at this time, and added Asia, Australia and the Soviet Union to his list of State Department?funded destinations. At the top of his form, Hines also displayed his endearing quirks (not to say grunts) in these performances. Sometimes he sang as he played, especially his own "They Never Believed I Could Do It - Neither Did I". In 1975 he made an hour-long "solo" film for British TV out-of-hours in a Washington nightclub: the "New York Herald Tribune" described it as "The greatest jazz-film ever made". He played solo in The White House and played solo for the Pope ? and played (and sang) his last job a few days before he died in Oakland, quite likely somewhat older than he had always maintained.